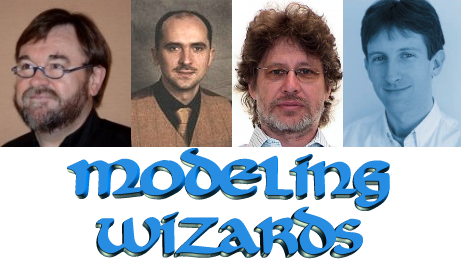 I'm privileged to have been invited to give a keynote session at the Modeling Wizards masterclass in Oslo, Sept. 30 -- Oct. 2. As you can see from the pictures, there's an impressive line-up of speakers: Jean Bézivin, Krzysztof Czarnecki, Øystein Haugen and other luminaries from the field of model-driven development. Unlike other conferences and workshops, this isn't just people submitting their own papers. As the title and line-up maybe reveal, the idea is to offer the best possible training in MDD for the participants. The three-day program offers "a set of carefully selected lectures dealing with various aspects of modeling and with a particular focus on domain-specific languages. The objective is to provide each attendee with sufficient information to understand the main issues and challenges in the use of modeling and domain-specific languages, and also to have a clear picture of the most recent advances in the field." One thing I'm particularly happy to see is a mini-project running each afternoon, where participants will get the chance to put what they are learning into practice, with a helping hand from the speakers. I'm a big believer in the master craftsman - apprentice mode of learning, and have benefitted greatly from it myself over the years. To ensure the personal attention necessary, places are limited -- so sign up now! The price of around 887€ includes accommodation and all meals for the three days, which compares very favorably with any other training I've seen. With the timing just before MODELS 2010, you can even get two events for the price of one set of air fares!